Fan & Mallet (団扇と小槌) társasjáték - Magyarország társasjáték keresője! A társasjáték érték! A Fan & Mallet (団扇と小槌) egy remek társasjáték, 2 játékos részére, az átlagos játékidő rövid, csak 30 perc. A társast, 10 éves kortól ajánljuk kipróbálni. 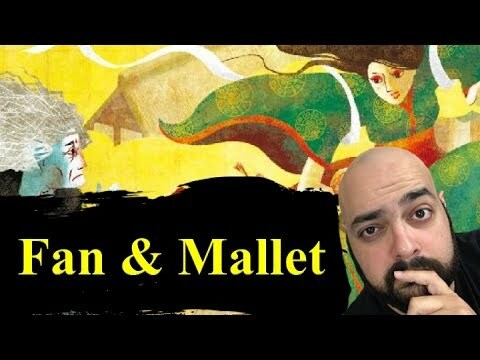 Fan & Mallet (団扇と小槌) is a two player game in which one player takes on the role of the god of riches and the other assumes the role of the god of poverty in a friendly competition for control over a small village. On their turn, each player places one of their god’s followers on one of the buildings in the village. Each god has the same two types of followers: Tsukumogami (Spirit Objects), household items possessing a soul that animates them and Zashiki-warashi (Kid Ghosts), playful child-like spirits. Each follower has a strength value and once a building has five followers placed on it, the total strengths of each god’s followers placed there are then compared. Spirit Objects have a number that represents their strength, while Kid Ghosts have strengths that can vary through powerful special abilities which are triggered by the arrangement of other spirits at the same building. If the strength of your faction is greater, you place one of your god’s possession markers on the building. Using clever placement of your followers to better capitalize on each Zashiki-warashi’s special ability is key to victory in Fan and Mallet. The first player to place all seven of their possession markers wins the game.